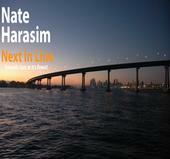 Nate Harasim is a young musician full of hope and we place our hope in him. What is the reason for this hope? Still in high school he was already asked as a sideman by Norman Brown, Pamela Williams and Tom Braxton. And you should also be aware that Nate was signed as a Yamaha recording and touring artist. If words cannot convince, there is a simple way to be persuaded: Listen to his debut album Next In Line (2007). It's one thing to master an instrument. But Nate is not only a huge talent like Brian Culbertson (or should I say Bob James), he has that something what music turns into gold. His distinctive feeling for groove and melody mirrors in every track. It's incredible how easy and elegantly Nate touches the piano keys on Next In Line increasing the tempo to a furious finale. On Holloway Cruise he shows profound sensitivity and sentiment. The tune features Mitch Manker on trumpet who is perfectly set in scene by Nate's arrangement. Mitch earned merits with Fattburger, Robben Ford, 3rd Force and more. There are several Somersets worldwide, but to understand Nate's imagination of Somerset one has just to relax and sit back listening the tune. Behind the cryptic number 92101 stands another catchy melody. If you like Rick Kelly's Soul Ballet you will love Nate Harasim's music, a consequent development. Sweet Dreams is not a cover of the old song of the group Eurythmics. By the way Nate has written all tracks of the album. There is no cover on this album. His melodies are hooking but volatile like a cloud of perfume. When the sun goes down at Mount Soledad in San Diego there is a melancholic mood. Soledad Sunset encompasses this feeling in an awesome contemplative interpretation. Especial Mitch Manker on muted trumpet is a master of mood. The atmosphere in South California is influenced by Latin music. Tropical Mist is a product of this local situation. Nate creates the drum rhythm in an intelligent way and his piano play has that typical Latin flavor. Some tunes like Breathe are on the borderline between New Age and Smooth Jazz. Nate has a undoubtedly an affinity to mellow melodies and tones. In contrast one finds the up-tempo Driven with a propelling rhythm and Ethan Flore on guitar. Views of ocean,sand and whitewater give the feeling of being on the ocean. This is Coronado Shores in San Diego. A beautiful place deserves a catchy melody. Look 'n' Back is the final track with Nate's ethereal music. Nathan Harasim wrote this album reflecting all the places he has been and lived. Next In Line is for all music lovers with a romantic vein. Nate's album is the translation of Milton's poetry into music. An inclination of reverie and wonder.